JERRY PANDERING As Gov. Brown is poised to exit politics, his final budget blows. 'It's not because I'm conservative," California Gov. Jerry Brown once quipped. "It's because I'm cheap." With the reports of historic lows in unemployment and record highs in the stock market, it is unconscionable that the governor suggested stuffing even more into the already bloated rainy day fund. 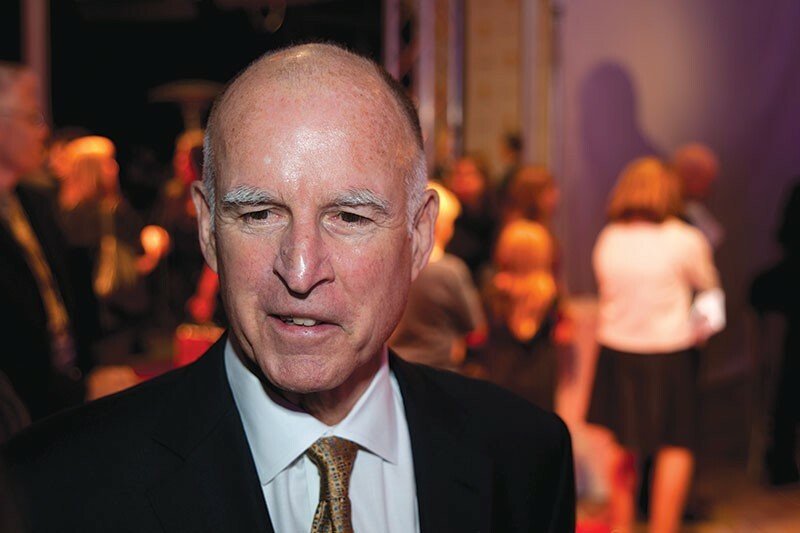 In his budget, Brown called for the state's rainy day fund to be fully funded with an injection of more than $4 billion, to bring it to $13.8 billion. But many residents in fire-scorched Sonoma County don't have the means to get out of the rain now. As the Mercury News noted in early May, when Brown released his revised budget, "Anyone hoping that $9 billion surplus—up from the $6.1 billion projected in January—would translate into a windfall for California's public universities, affordable housing development or healthcare might be disappointed by Brown's budget plan." The paper also noted that there's time for lawmakers to insist that Brown's $190 billion spending plan do a better job of tending to the needs of the state's poorest, even as his revised budget ramped up spending on education and funneled some of the surplus to housing and mental-health programs. His current plans calls for most of the budget surplus to be split between the rainy day fund and another reserve fund. The U.S. Census Bureau reports that 20.4 percent of Californians live in poverty. That's higher than the national average (14.7 percent) and the highest poverty rate in the nation. California also has the highest child-poverty rate in the nation. The wealthiest state in the wealthiest country in the world is also home to 25 percent of the country's homeless. That's a crisis which has come home to roost in Sonoma County. The county already had an affordable-housing crisis before the October wildfires, and the recent shuttering of several homeless encampments around the county served to highlight a systemic failure in the state and county to come up with long-term housing solutions. The crunch has been cruelly borne by veterans, and the governor is responding to this crisis by hoping the voters will approve a bond in November, the Veterans and Affordable Housing Bond Act of 2018. Brown is being true to his claim of being cheap when it comes to the poor. The 2017–18 Health and Human Services budget was $161 billion, and the governor is recommending it be cut to $158.7 billion. It might serve the governor to remember what Martin Luther King Jr. once said: "Whatever comes to you in a cheap way will vanish in a cheap way." Jeff Green is a research and policy analyst for the California Partnership, an economic justice coalition of low-income residents and people of color. Tom Gogola contributed reporting to this story, a version of which originally ran in the San Jose Metro.